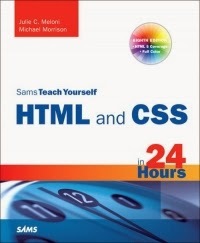 In just 24 lessons of one hour or less, you can learn how to use HTMLand CSS to design, create, and maintain world-class web sites. Using a clear, down-to-earth approach, each lesson builds upon the previous one, allowing even complete beginners to learn the essentials from the ground up. Full-color figures and clear step-by-step instructions help you learn quickly. Practical, hands-on examples show you how to apply what you learn. Quizzes and Exercises help you test your knowledge and stretch your skills.